Welcome to Sam Buchanan's RV6 web site! I hope you will find this site to be informative and entertaining as you continue to gather information about the RV series of kit-planes. I solicit your comments and suggestions on this site as long as they are fairly nice and you use good grammar. Update 10/1/99; N399SB has now accumulated 25.0 hours and is free to go when and where she wishes due to the completion of the test phase. I suppose this is a logical place to end the twenty-two month saga of how several crates of aluminum parts became a fully commissioned aircraft. In actuality I realize that the saga has just begun since no homebuilt aircraft is really ever finished as long as it is in flying condition. Profuse thanks go to the hundreds of readers who faithfully followed the construction process of my RV6. I hope your projects, either present or future, bring you great enjoyment and fulfillment. P.S. Check the Front Page for updates as the hours accumulate on N399SB. Disclaimer! This site describes the construction of N399SB only! It is in no way a depiction of construction practices and sequences that are officially approved by Van's Aircraft or anybody else that knows what they are doing. If you follow the construction steps shown in this site specifically for the construction of your aircraft, you are a gullible individual indeed! Every custom built aircraft should be frequently inspected by folks who are competent in the construction of fast little airplanes, and the construction logs herein depicted are for your entertainment only. The intention of this site is to give you an overview of what the RV6 kit is all about from the viewpoint of a builder (empennage kit begun 10/28/97). You will be privy to my many triumphs and displays of ingenuity and also the occasional "UH-OH!!" Since I am more interested in building an airplane than managing a web site, the construction notes will be brief but hopefully helpful. This site will maintain a standard of decency that will be suitable for viewing by all members of your family so the rather, uh, well, innovative phrases and characterizations that can follow a major booboo in the shop will be deleted from the record prior to publishing. 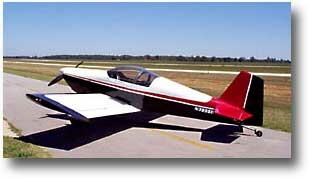 Of all the kits on the market, why build an RV6? To answer that question you must examine the traits you desire in your Perfect Plane. Do you want to go fast? Do you want to travel? Do you want to be able to takeoff and land on short grass strips? Do you want an airframe that is built with established methods and will last a long time? Do you want an aircraft that can loop, roll, and not come apart in the air? Do you want a plane that offers a good value for the money spent and a fair chance for good resale? You don't want much, do you! 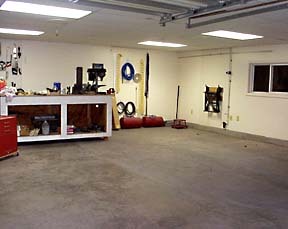 However, the RV series of kits enable you to achieve all of the above goals and give you the incentive to live in your shop for a quite a while in the process. Actually, most RV builders consider the construction phase of their plane to be well worth the effort and besides, you emerge from the shop with flesh and beady little eyes that have been protected from the ravages of the sun for the past couple of years and hands that possess the skills needed to BUILD ANOTHER PLANE!! And so you ask, why the -6 and not the 6A? Because all real planes have big round engines and the little bitty wheel on the tail! I haven't figured out yet how to get the big round engine on the RV6, however.